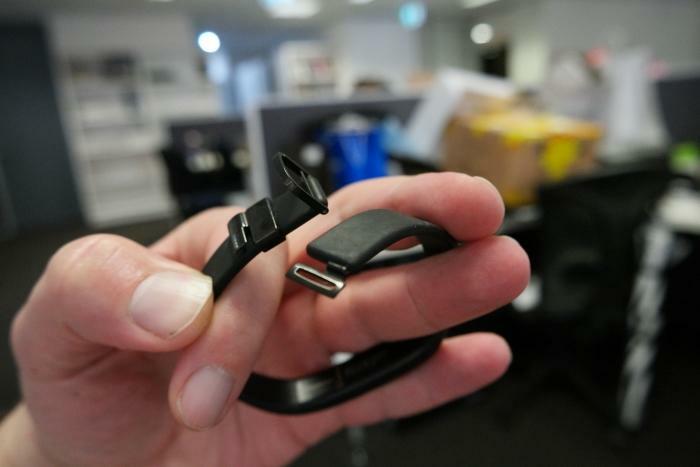 The Jawbone UP2 experience is different to that of many other activity tracking devices we’ve seen. It’s a wristband rather than a wristwatch, but a wristband without a dedicated screen. You can’t glance at it to see your progress and there are no buttons on the device that need pressing. You simply wear it and then check in to the app on your phone every now and then to see what’s going on. Occasionally the wristband will vibrate to let you know that you should probably get up and move a little bit, and at the end of the day it might flash a glorious dance of its lights and vibrate more vigorously to let you know that you’ve met your step goal for the day. In fact, this device celebrates the meeting of goals more flamboyantly than most devices we’ve tested, and that’s one of the key points about Jawbone’s activity tracker: it’s made to celebrate your achievements and help you push a little further, rather than merely keep a record of your steps. This is most evident in the software, which has a smart coach that can tell you what you need to do to meet your daily goal, as well as push you each day to be a little more active. 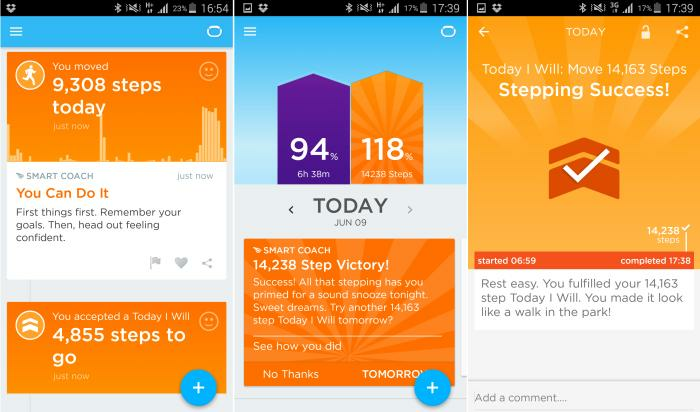 Each day you might get a challenge (called 'Today I WIll') from this smart coach to meet a certain step count, or to go to bed a certain time, or to eat healthier foods. It’s a more active way to improve your progress, though you can set goals manually, too. Add to the mix a ‘social feed’ that can allow you to see what your friends (teammates) are doing, and you can see it provides not only guidance, but a fair bit of motivation to ‘win’ — you will want to end up walking more than your mates and show them who’s a hot-stepper. You don’t get an immediate sense of statistical satisfaction with this device like you do with a watch that displays an active count of your steps, distance and calorie burn. Instead, your Bluetooth-paired mobile phone and the UP app will be your main interface when you want to check up on your progress. The way the data is refreshed is a bit of a mystery. You can’t manually force the wristband to sync with the app whenever you want. It just sort of does it on its own, whenever, and in a certain way. For example, when opening the app for the first time in a while, you might notice that the step count increases a little, then stops. Then it increases a little more, and stops again. For us, it sometimes did this more than a handful of times before the step count was completely up to date. And there was no way to see a real-time step count. Since it relies on a low-energy Bluetooth connection to update its data, you just don’t get that immediacy. The main interface is a feed that shows you your daily progress, tips and coaching, as well as stats from your teammates. 'Today I Will' challenges are given now and then from the 'smart coach' as a way to boost your activity level. We tried to gauge the Jawbone UP2’s step accuracy by counting off a handful of steps at a time, then waiting for the app to sync. We were always one or two steps off what the app recorded, so we felt as though this wasn’t a good test for this particular device. We took a more broad view and decided to judge the accuracy in chunks during periods of the day. Our data suggests that the Fitbit is more active in the way that it tracks small steps taken around the office, or in environments where slow movements are frequent, such as times when you leisurely stroll around an art gallery. Comparing data between the Jawbone and our Fitbit on a day in which there was a mixture of high activity and slow stepping, we noted that the Jawbone and Fitbit were almost neck and neck when recording the high activity (12,029 steps for the Jawbone and 12,083 steps for the Fitbit), but that the step count for the Jawbone fell off sharply when we factored in the slow stepping (18,295 steps for the Jawbone and 18,791 steps for the Fitbit). Still, it’s better to under-count than to over-count, as this means you are definitely getting your fill of movement and more, rather than selling yourself short each day. In addition to the step count, the app will show you the distance you travelled, the amount of time you were active, as well as break down the longest active streak and the most idle time (in minutes). Left to right: step data, logging an activity, getting a reward for consistent stepping. Calories burned while resting and while active are shown, in addition to the total burn, and this type of granular information can help you push the active burn a little higher each day — it’s much more motivating than seeing only the total burn. 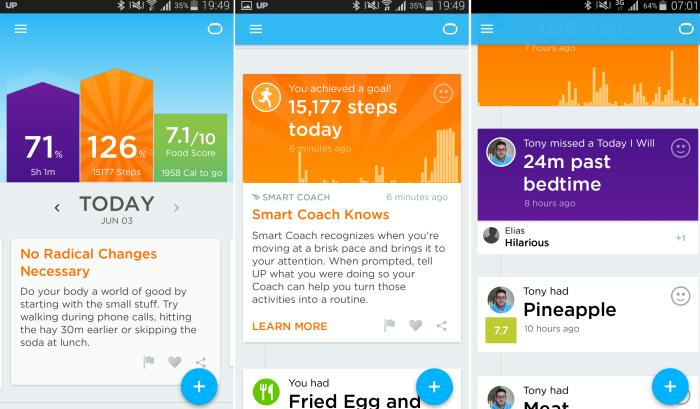 You can record your calorie intake through the app using Jawbone’s inbuilt database of foods. It’s not easy to log food in the beginning, as you rarely find perfect matches for what you’ve eaten. We found that we often had to enter ingredients separately if we made elaborate sandwiches, for example. The good thing is, after you’ve entered a bunch of different foods (especially ones that you eat regularly), they are kept as ‘shortcuts’ and you can refer back to them to add them to your daily intake. The app will give you a score on how healthily you are eating (the aim is to make your score card go from red/orange to green), and you also get a breakdown of a food’s nutritional value. Think of it more as a general guide to eating healthier rather than a scientific method, and use it as motivation to eat better more than anything else. If you and your teammates share food data in your social feed, then you can use this as further motivation to eat better or end up facing judgment. We like the idea of the social feed for keeping track of your teammates and sharing your own data with them. You can send a smiley face their way when they’ve met a goal, or simply leave them a comment. Again, there is that theme of motivation that pops up, and having this social feed active as part of your activity tracking certainly helps to push you further; you are competing against others in addition to yourself. The only problem is when your teammates are not very active and you always end up winning. As part of a total activity tracking solution, you can also use the Jawbone UP2 to keep record of your sleeping pattern. Double tap on the wristband until its light illuminates, then tap and hold down the tap until it switches from the orange to the blue icon. This will put the wristband into sleep mode. While you wear the wristband, it will track the way you sleep, noting periods of activity and inactivity that can define when you are awake, and when you are in deep sleep and REM sleep. It can vibrate in a certain way to wake you gently in the morning. If you’re not used to wearing a watch to sleep, the wristband could be more of a nuisance than an aid until you get used to it. Luckily, you can tell the Jawbone app when the hours of your sleep are most likely, and if you don’t wear the wristband to bed, it will still give you a ballpark figure of when it thinks you were asleep and ask you to confirm it. For the most part, it was impressively accurate, and allowed us to log sleep by slightly adjusting the start and end times manually. (We'll add that the app also accurately guessed when we were engaged in a walk or run, allowing us to log those activities easily). However, you don’t get the extra information about your sleep pattern just by logging start and stop times. You must wear the wristband for the in-between data to see how well you are actually sleeping. We think it might be a case of wearing the wristband only if you are already having trouble sleeping, to see if that can help you establish a better sleeping pattern. If you are already sleeping well, then it might be an idea not to wear it. The design of the band itself is thin and lightweight, with a buckle that’s unlike what you might be used to on a watch. It takes a bit of fiddling to size it just right, and then some more fiddling to hook the buckle into place. It took us about half a minute to get the thing on each morning, but the idea is that you just keep the band on all the time — until it’s time to charge it. As of this writing, the Jawbone UP2's battery had lasted us almost eight days on one charge (with the app telling us there is two days left), which we think is a good effort. 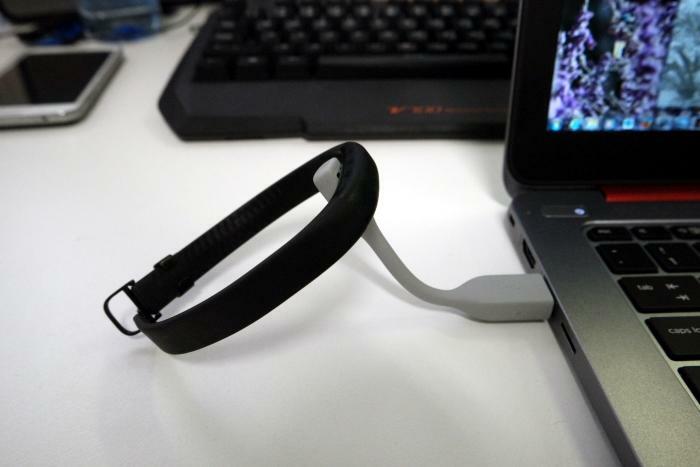 The charger has a magnetic head that is attracted to the wristband, but it’s a tiny charger than be a little awkward to use, especially if you want to charge it by plugging it in to a laptop that’s sitting on a desk — the band gets in the way a little in this scenario. Charging via a laptop can be a little awkward. We grew to like this activity tracker. It was a different experience to the Fitbit we are most used to, in particular because of the more active social feed, and the built-in coaches that can spur you to move more in order to improve your daily step counts and achieve your goals. 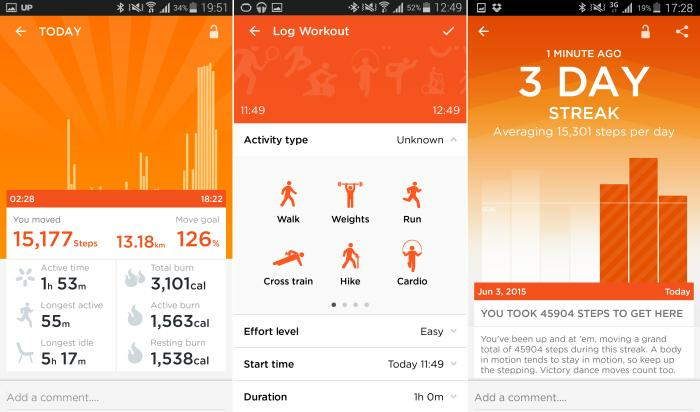 It’s not the type of device to go for if you want an active tracking of your steps at a glance of the wristband, but it is the right one to go for if you want a good mix of stat tracking and motivational social tools. The caveat is that you need to buy your friends one, too. The New Zealand retail price is $170.